Ted Geisel (Dr. Seuss) half-length portrait, seated at desk covered with his books / World Telegram & Sun photo by Al Ravenna. Dr. Seuss is the Pen name used by an American book author and illustrator, he is most widely known for writing some of the most popular and best selling children's books of all time, publishing over 60 titles and achieving over 600 million sold copies. 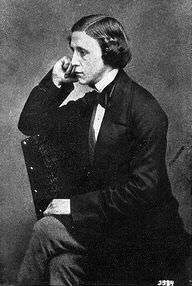 An academy award winner for his documentary film “Design For Death” in 1947, and two time Lewis Carroll Shelf Award winner for his books “Horton Hatches the Egg” in 1958 and “And to Think That I Saw It on Mulberry Street” in 1961”. His Birthday, March 2nd has been established as “National Read Across America Day”, a holiday created by the National Education Association. 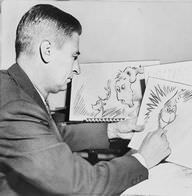 Ted Geisel, American writer and cartoonist, at work on a drawing of the grinch for "How the Grinch Stole Christmas"
Dr. Seuss was a famous American author, poet, and illustrator, who was born on March 2, 1904. 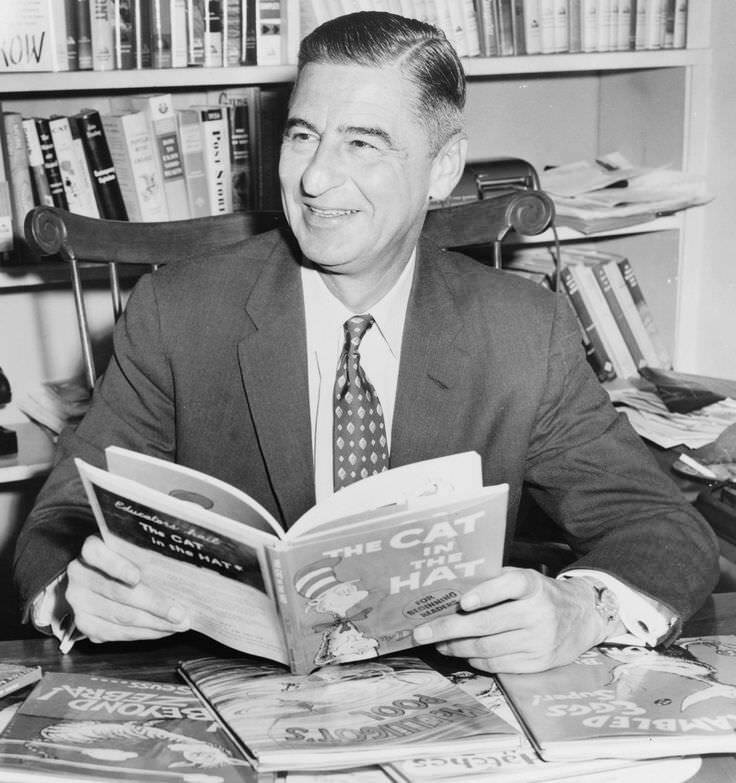 As a person born on this date, Dr. Seuss is listed in our database as the 2nd most popular celebrity for the day (March 2) and the 2nd most popular for the year (1904). 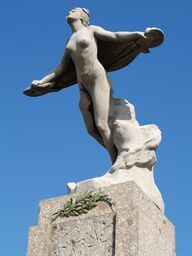 People born on March 2 fall under the Zodiac sign of Pisces, the Fish. 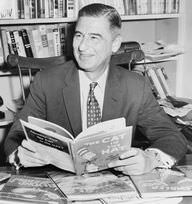 Dr. Seuss is the 37th most popular Pisces. 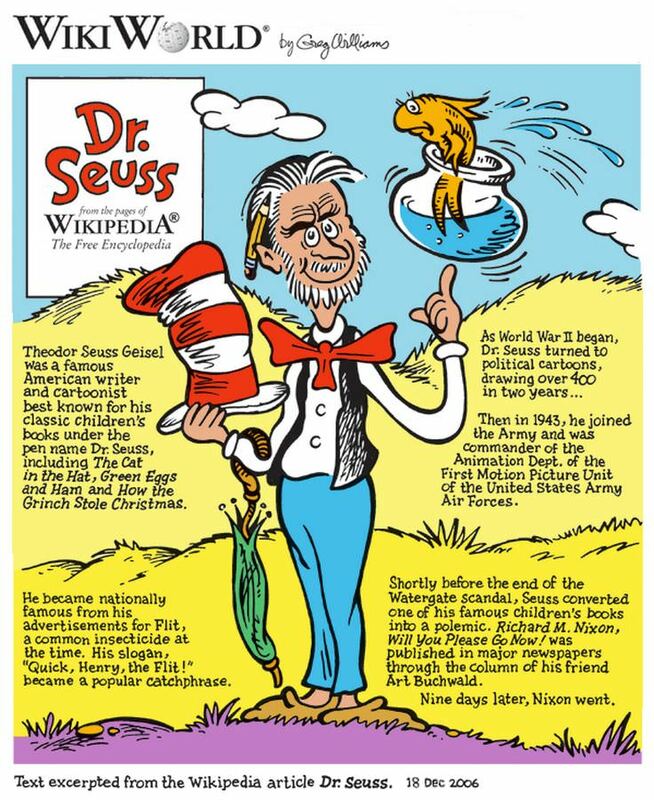 Aside from information specific to Dr. Seuss' birthday, Dr. Seuss ranks 14th in famous people born in Springfield, Massachusetts, U.S. 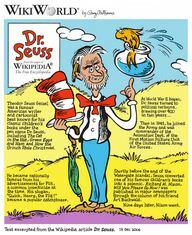 In general, Dr. Seuss ranks as the 423rd most popular famous person of all time. “The Famous Birthdays” catalogs over 25,000 famous people, everyone from actors to singers to scientists to serial killers and more. If you're curious to see who was born on your birthday, you can use our database to find out who, what, where, when and why. You can search by birthday, birthplace, claim to fame or any other information by typing in the search box, or simply browse our site by selecting the month, the day, the horoscope, or any other clickable option. 14th born in Springfield, Massachusetts, U.S.